A picturesque area with great views, an interesting history along with electric BBQ and toilet facilities for your convenience. 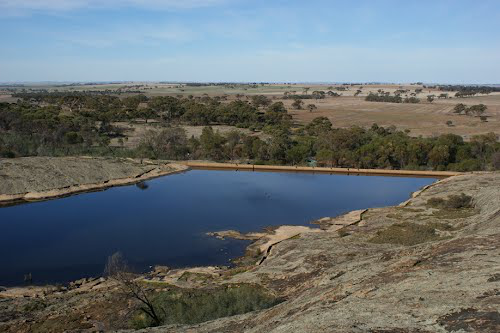 Toapin Weir, the largest and most comprehensive privately constructed reservoir and water scheme in Western Australia, entered the State heritage register in 2012 – its centenary year. Toapin Weir, built around a natural granite rock outcrop, is unique because of its scale and construction by a private landowner. Innovative private landowner Jonah Parker appointed experienced engineer T. C. Hodgson to design Toapin Weir to provide water to service his farm and the local town of Dangin, as well as provide water to the railway. In 1935, WA received 125,000 pounds sterling for its country water schemes as part of the national program of works for unemployment relief. As part of this program, Toapin Weir received funding to raise the Weir wall, which extended the water scheme. This extension increased the storage capacity to 22.7 million litres, which allowed water to be pumped to the town and district of Quairading. The Pink Lake in Quairading is regarded locally as a natural phenomenon. At certain times of the year, one side of the lake becomes dark pink, while the other side remains a light pink colour. During summer, evaporation causes the water level to drop and salt builds up on the fences and trees. When the water returns, the salt causes the pink colour. Quairading’s Pink Lake is located 11km east of Quairading on the Bruce Rock Road. This road passes straight through the lake, so you can’t miss it! The Rabbit Proof Fence is the longest fence in the world! Two re-created examples of the fence and rabbit traps are located south of Quairading on the Corrigin Road. There are three fences in Western Australia: the original No. 1 Fence crosses the state from north to south, No. 2 Fence is smaller and further west, and No. 3 Fence is smaller still and runs east–west. The fences took six years to build. When completed in 1907, the rabbit-proof fences (including all three) stretched 3,237kms (2,023 miles) The cost to build the fences at the time was about £167 per mile ($250/km) which totals just over $80 thousand dollars. The granite outcrops of Mount Stirling and Kokerbin Rock (reputedly the third biggest monolith in Australia) are located 30kms east of Quairading. The area holds great significance for Aboriginal people. The beautiful views make a drive this way well worthwhile. See the old Church when you visit Mt Stirling. Enjoy a bushwalk and picnic facilities at Kokerbin Rock. The Granite Way is the WA Wheatbelt’s newest self-drive trail and a partnership between the Shires of Bruce Rock, Quairading and Kellerberrin. 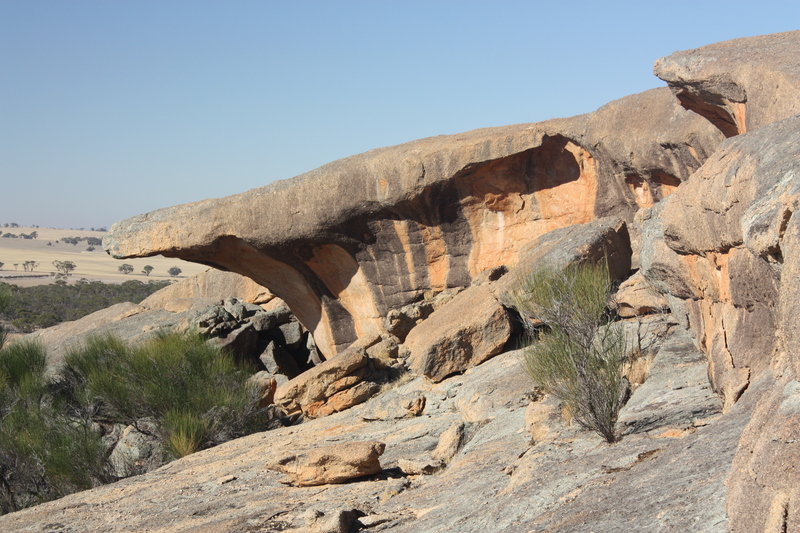 The trail takes visitors on a journey to some of the most amazing and iconic granite rocks in the Wheatbelt, spectacular nature reserves and farming vistas. The trail provides picnic facilities and interpretation at various locations, giving trail goers a greater sense of the rich flora, layered histories, fascinating geology and various communities who call, and have once called the area home. The Quairading area is well known for the existence of Banksia Cuneata, commonly referred to as Matchstick Banksia or Quairading Banksia. The Banksia Cuneata is an endangered species of flowering plant in the Proteaceae family. The current logo of the Shire of Quairading depicts the Banksia Cuneata flower. Ian Wills was born in Quairading in 1944 and died on the 7th September 1980. During his life, in spite of being dogged by ill health, he played an active part in the community. It was while working on the family farm that Ian became fascinated by the shapes of the roots of trees and their grain and colours. In 1969 he first started to experiment with the development of natural wood sculpture and became what is believed to be the only full time natural wood sculptor in Australia. Ian’s best known work, called ‘PEACE” was exhibited in Allendale Square for the State’s 150th Anniversary Celebrations, and in recognition of his work in promoting Quairading as the “Home of Natural Wood Sculpture” he was named as our Citizen of the Century in the field of Art and Culture. His death at such an early age deprived Quairading of an original and dedicated artist. View the Natural Wood Sculpture collection which is on display at the Visitor Information Centre located at our historic Railway Station in the main street. Viewing can be arranged outside normal hours. The centenary of the Railway Station was celebrated in April 2008. The Vintage Club is situated behind our Railway Station on Parker Street. 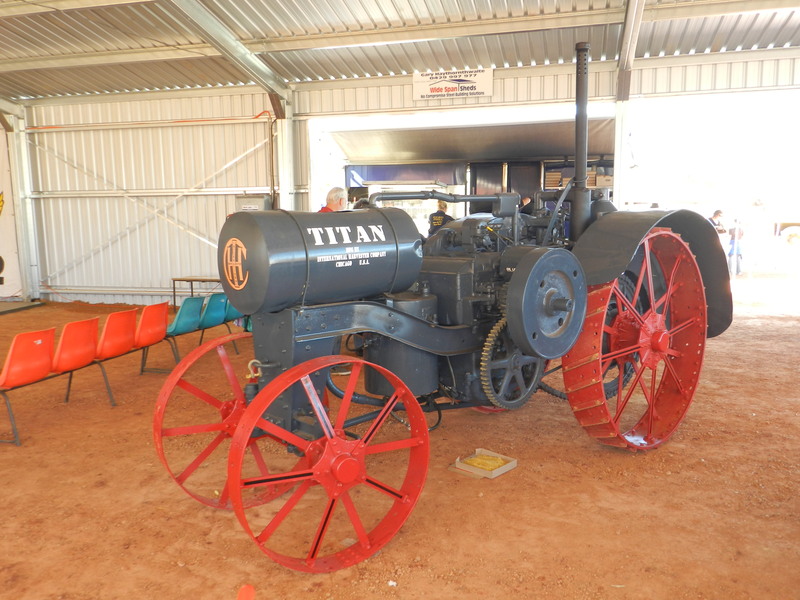 The club displays a great range of vintage working farm machinery, stationary engines and motor vehicles. The club is generally open from 10am every morning Monday to Saturday. Feel free to call in – the club members would love to meet you. Meet the Grain Family; Wesley Wheat, Basil Barley, Ollie Oat and Lucy Lupin; a concept of local artist Lyn Whyte, the family can be seen in quite a few locations around the Quairading district. There are HM?? In total – how many have you spotted so far? A 527 hectare reserve, ideally located just west of town, is just perfect for a gentle amble along the walk trails with the occasional sighting of kangaroos and echidnas. A wonderful display of wildflowers during spring is a sight not to be missed. Join locals for a monthly guided walk on the 15th of April-September usually meeting at the Reserve at 10.00am. 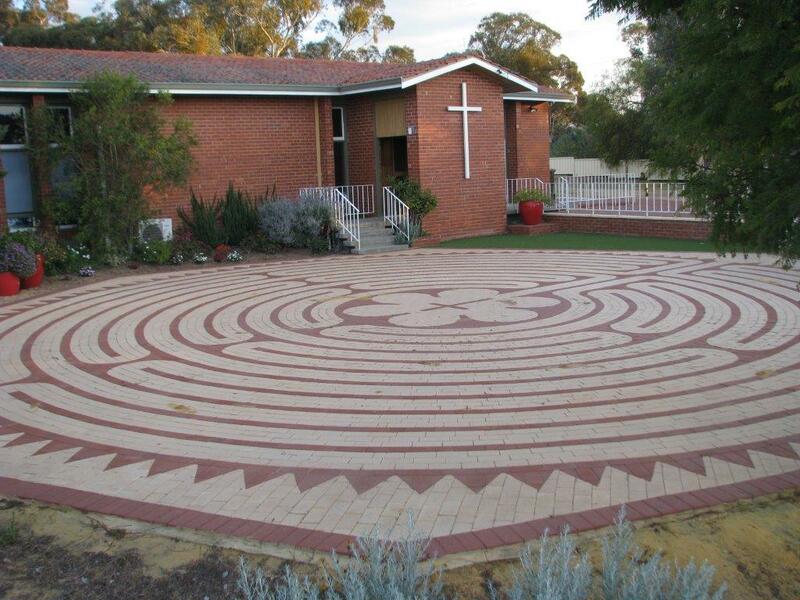 This Chartres 11 ring Labyrinth was built by residents of our town for contemplation and quiet thoughts whilst wandering through. It is one of ten listed at WA locations around the state. 8 are located at public places including churches and two are private. You’re welcome to visit ours at the Anglican Church on Harris Street, Quairading. The original tree grew on a ridge above the beaches at Gallipoli. It was known as the Lone Pine because it was one of the last pines of any size left before being shot to pieces just above The Nek. A Victorian Sgt Keith McDowell picked up a pine cone and put it in his haversack. After sending it to his Aunt in Warrnambool, she grew 4 seedlings from it, one of which is now growing at the Melbourne Shrine of Remembrance. It is from this tree’s seeds that our tree has grown. It is a Brutian Pine and is doing very well. During 2015 other projects are coming into being as part of our War Memorial precinct and in readiness for Centenary of ANZAC Day ceremonies. This park was developed to honour the residents of our community who have achieved the grand age of 100 years. We currently have seven Centenarians honoured at the park known as Centenarian Corner.